The best thing about traveling is hitting up the local legendary places. 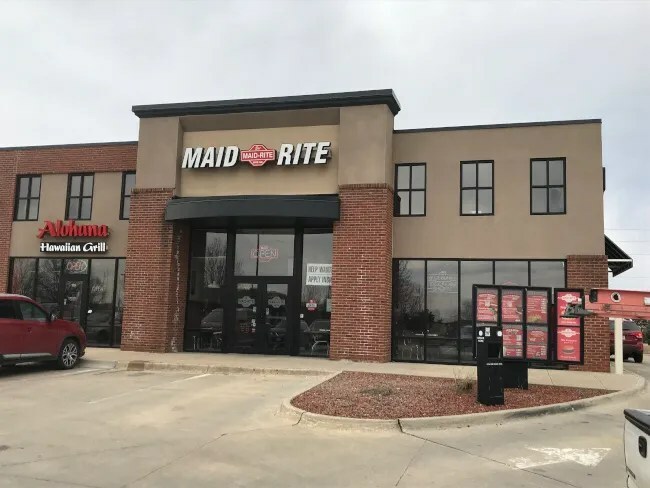 I worked in Central Illinois for about five years and made many trips to Iowa City and Cedar Rapids so I was fairly familiar with what a Maid-Rite is….but the two guys I was traveling with this week had no clue. We needed a pretty quick lunch before starting our day on Saturday. I had noticed one of those blue signs on the highway for a Maid-Rite at the exit before ours. The guys I was with had no idea where we were going but they didn’t care as long as we were getting food. 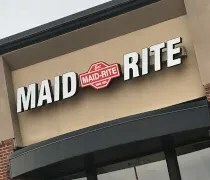 Maid-Rite in Ankeny is Oralabor Road just west of the interchange with I-35. The restaurant is a fairly new one in a strip mall near the Walmart. For most of you reading, I’ll go back a little bit. 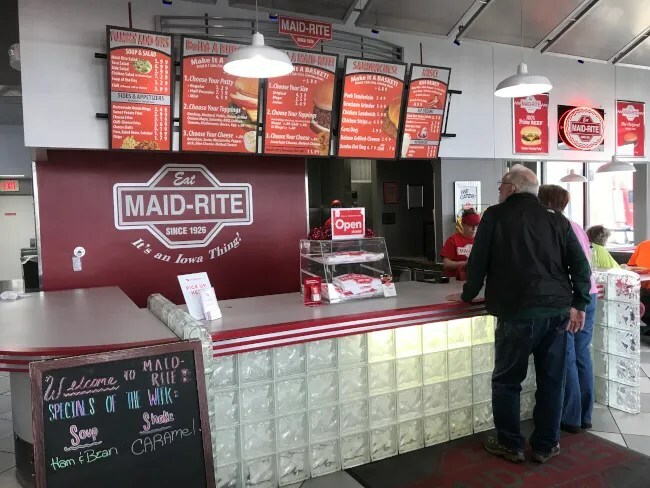 Maid-Rite is an Iowa chain with stores in Ohio, Arkansas, Illinois, Nebraska, Minnesota, and Missouri. The restaurant dates back to 1920’s in Muscatine, IA. There are now 70 locations across those eight states. 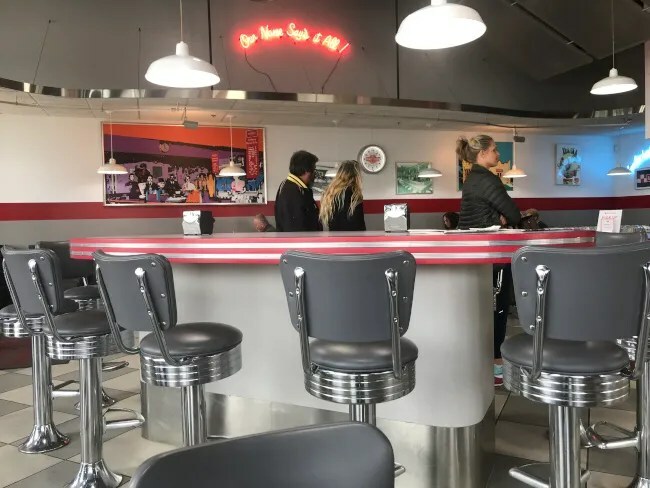 The restaurants are all 50’s style diners that serve Maid-Rite sandwiches as their marquee menu item. Think sloppy joe without the sloppy. The restaurant is counter service. We walked in behind what had to be the two slowest orders ever. There isn’t a lot on the menu but it took them over 10 minutes to put their order in. As you can see from the menu hanging above the cash register, there isn’t a lot of options so it shouldn’t take that long. We all put our orders in individually then went to take a seat in the small dining room. There’s a large pub style counter in the middle of the space which is kind of odd. No one was using. It kind of has the feel of a lunch counter at a diner but there is no table service at Maid-Rite. We just took a four top. The dining room is a comfortable typicaly diner. 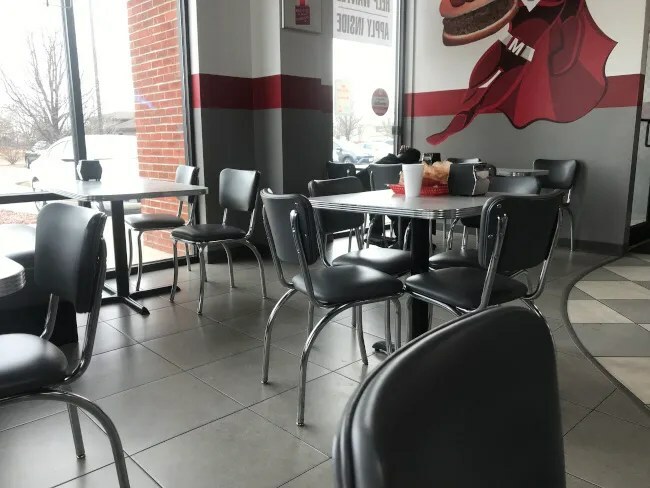 The floor is checkered tile and the furniture is typical fast food style tables and chairs with that 50’s diner flair. I ordered myself a Mega Maid-Rite and made it a basket with fries and a pop. Like I mentioned before, a Maid-Rite sandwich is a loose meat sandwich which is like a sloppy joe without the sauce. The seasoned ground beef is piled high on a soft white bun. I had a slice of cheese added on to hold some of the meat together but for the most part, it’s as messy as you would expect. The sandwich comes with a plastic food to pick up the dropped meat after you’re done with the sandwich. It’s a surprisingly good sandwich for being so simple. 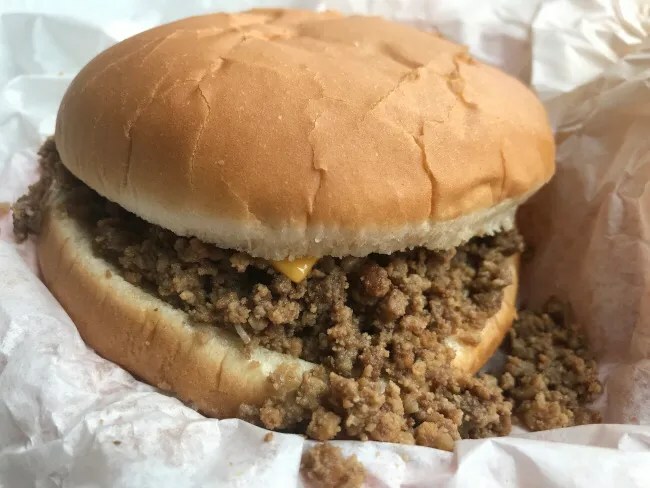 I know the idea of going for a “loose meat sandwich” seems odd to outsiders but it’s something you really need to do in Iowa. 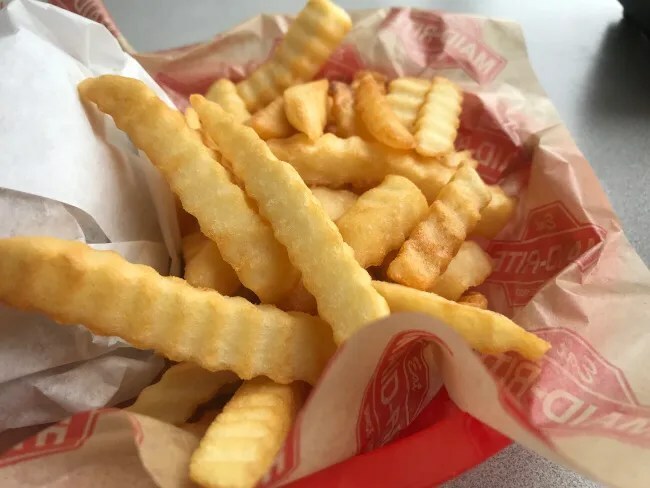 The fries were simple, frozen, crinkle cuts that need a little seasoning. They were good filler but they’re really just simple fries that aren’t much to write home about. My bill for lunch was just a little over $10. Maid-Rite is so Iowa and that’s such a good thing. I used to eat at one in Normal, IL (no longer there) when I worked in the area and I haven’t had one since. I was a little excited when I saw the sign that there was one close to our rental so I could take my colleagues for a sandwich. I don’t think they were super impressed but at least they have another story to tell about our trip to Des Moines.